Kitchener, ON. 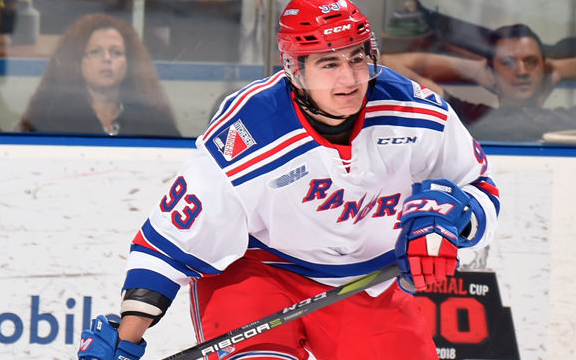 : The Rangers (7-7-2-0) just couldn’t seem to capitalize against the visiting Windsor Spitfires (7-9-0-1) during their second of three-straight home games. The Blue Shirts were shutout for the first time this season, 3-0. Luke Richardson played well in net, stopping 24 of 27 shots. It didn’t take long for the action to get going with Windsor visiting The Aud on Friday night. On just their first shot of the game, the Spitfires’ Curtis Douglas netted his fifth of the season to put the Rangers behind early, 1-0. Michael Vukojevic took a slashing penalty at 8:26 that the Kitchener penalty-kill managed to defend against brilliantly with no real pressure being brought by Windsor. Seconds after the penalty ended however, the Spitfires managed to net another to make it 2-0 halfway through the first. The Rangers had two powerplay opportunities in the period but just couldn’t get into any type of rhythm and that kept the Spitfires on top going into the first intermission, 2-0. Kitchener was outshot 11-8 in the opening frame. The second period was the period of almosts. The Rangers came out with a spark right after the initial puck drop. Greg Meireles fired a shot on net that beat Windsor goalie Kari Piiroinen and brought the entire arena to its feet, but somehow managed to stay out of the net to keep the Spitfires lead at two. Shortly after, on a man-advantage, Kitchener was able to once again get the puck behind Piiroinen but the Finnish goaltender fell on the puck to keep his shutout hopes alive. Going the other way, Windsor put a puck past Richardson but it was via a high stick that was immediately waved off as a no-goal on the ice. The Spitfires led in shots going into the final period, 21-19. Out of the gate, the third period picked up where the second left off: plenty of back-and-forth play with no one team taking control of the game. It wasn’t until 8:00 of the frame that anymore scoring happened. Windsor’s Tyler Angle scored his fifth of the season against a stretched out pad of Richardson and it was 3-0 for the Spitfires at that point. That’s how the game would end. The Rangers finished the period with a 6-on-4 man advantage and put together some quality efforts but Piiroinen’s play was outstanding all night and it earned him the shutout. The final shots were 34-27 Rangers. Kitchener returns to action on at The Aud on Sunday, November 4 at 2:00 pm to face the London Knights. The next away game for Kitchener is on Tuesday, November 6 at 7:05 pm vs Peterborough. Kitchener, ON: The Rangers just couldn’t get anything going on Tuesday night. The Midwest division leading Guelph Storm managed two powerplay goals and a shorthanded goal on their divisional rivals and ended up winning 6-2. Michael Vukojevic scored the Rangers’ first goal of the game and Alexey Lipanov and Eric Guest picked up the assists. Midway through the third, Jonathan Yantsis picked up his team-leading 12th goal of the season. Lucas Pfeil, who came into the game to begin the third period, stopped 12 shots and didn’t allow a goal despite some quality chances by the Storm. It was the first of three-straight home games for the Kitchener Rangers (7-6-2-0) who were hosting their Highway 7 rivals, the Guelph Storm (9-4-2-0) in the Halloween game at The Aud. The Rangers had a depleted lineup going into the night. Kyle Gentles, Connor Hall, Nick McHugh, Reid Valade, Donovan Sebrango, and Matt Gordon were all out of the lineup and Carter Tresoor was on game two of a five-game suspension. Guelph opened up scoring at 5:30 of the first period on Liam Hawel’s seventh goal of the season and just like that it was 1-0 Storm. Shortly after, during a hooking penalty to Eric Guest, Guelph extended their lead when their captain, Isaac Ratcliffe, scored his team-leading 12th goal of the season and the score was suddenly 2-0. The Rangers were relentless in their pressure despite being down a couple and it paid off when Vukojevic (2) scored to bring the surging Rangers within one, 2-1. The lead didn’t last long, however. Kitchener was on a powerplay after an Alexey Toropchenko trip when the Blue Shirts, who were sporting red on the night, managed to give away the puck in their own end. Keegan Stevenson capitalized on the opportunity to make it 3-1. The Storm, who brought relentless pressure after their third goal, managed to find a fourth at 18:37 of the opening frame and that’s how the period would end, 4-1 Guelph. The Rangers were down in shots as well, 16-14. While the first-half of the second period brought no goals or penalties, and very few whistles, it cannot be understated how well Kitchener played. Halfway through the middle frame, for roughly three minutes, the Rangers pinned the Storm in their own end and it earned them a whole mess of shots and opportunities but their second goal proved hard to come by. Special teams were the Rangers’ Achilles heel on the night. After a tripping penalty to Jack York, the Storm almost immediately extended the lead to 5-1 on Ratcliffe’s second goal of the night. With 20.4 seconds left in the second period, Guelph netted another on Keegan Stevenson’s second of the game, and the period ended 6-1 in favour of the Storm. The shots were tied 27-27. The third started with a change in goal for the Rangers who brought Pfeil into the game for his fifth appearance of the season. Who else but Yantsis got the Rangers back on the scoreboard with his 12th of the season to make the game 6-2. With the goal, Yantsis extended his goal streak to five games, second best in the OHL. During the streak, he’s managed six goals and three assists, which has brought him to second on the team in points with 18 to Rickard Hugg’s 19. The game ended 6-2 with the shots tied 39-39. Pfeil saved 12 shots in his one period of work, a rare highlight for the Rangers on a rough night at home.